So after about three and a half hours of working in Minecraft, I have amassed a huge hole in the ground with lots of layers. I’m in search of coal because I have no way of having fire or anything that requires energy. 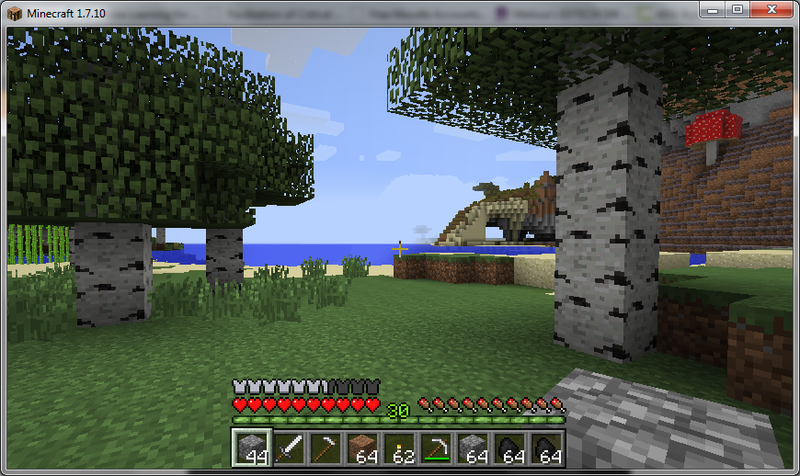 So far I’ve chopped down trees, made pick axes, and mined a heck of a lot of Cobblestone. 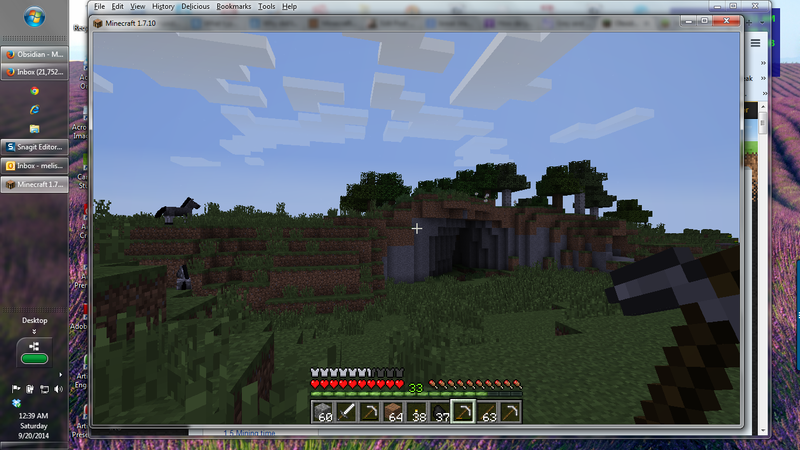 I don’t really want to make a house because I like my under ground dwelling. I like the stone walls. 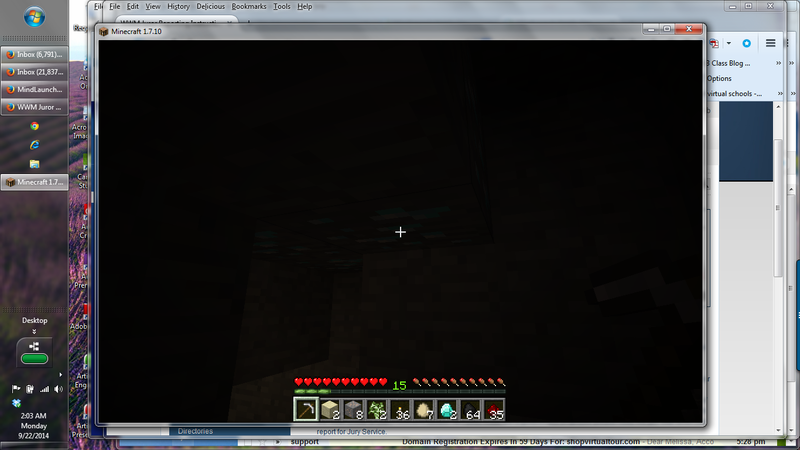 I put in a skylight by digging into the cave a little bit and then by digging up to make a break in the ground. Of course I was not planning anything so my skylight is actually under a tree, but if that is a problem, I can always chop down the tree. For the moment, I think having a tree cover the hole in my roof is a good idea. From what I understand, I can go down to find coal. I was sort-of doing that, while making a gradation so that I can climb out, but have not reached coal, lava, or anything more interesting than rock that turns into cobblestone yet. I almost killed the game because I managed to get myself down in the hole or a corridor pretty far and lost my light. I was not sure if I went too far so I’d not even see sunlight when the sun came up, and fortunately a few stray rays did make it down to where I was. With quite a bit of jumping and walking, I finally got out. Fortunately this means I don’t have to start from scratch if I want to keep this as my “home”. After making this video, I went searching for coal. I found some! 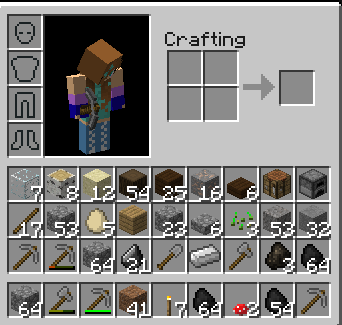 I now have coal, sand, a few pickaxes, a real axe, a hoe, some flowers, a couple furnaces, eggs, and various woods. I consulted with my local 12 year old expert yesterday because I could not figure out how to find iron. Now I am very confused. The pictures in this quest look like survival mode and I chose survival mode, by accident so I did not think anything was wrong. 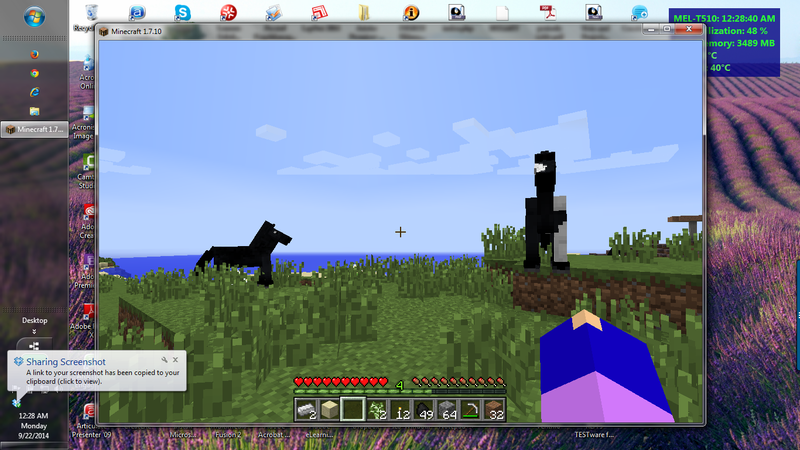 Colby, my adviser, told me that I would not be having inventory problems if I was in creative mode. So…looking back at quest directions, I have no clue if I should be in survival mode or creative mode. I’m going to keep this realm because I am really proud of what I found and created. 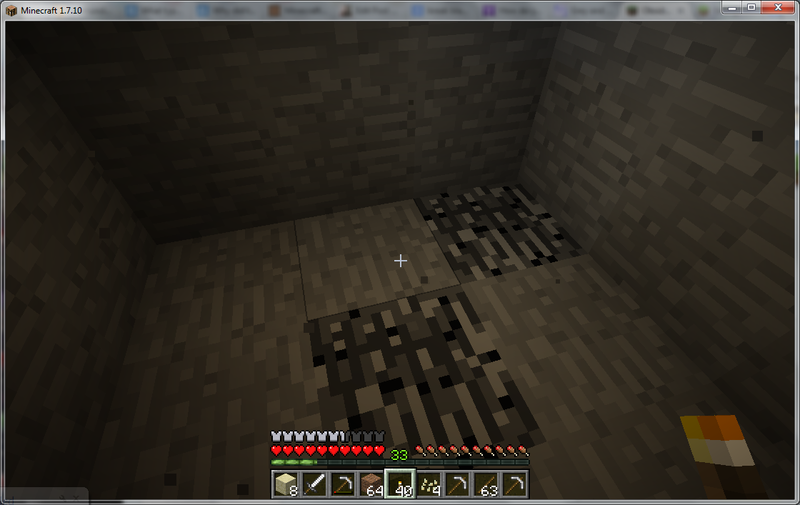 Even though I did not create any elaborate houses, I found coal and was able to make some torches. I figured out how to pick flowers. 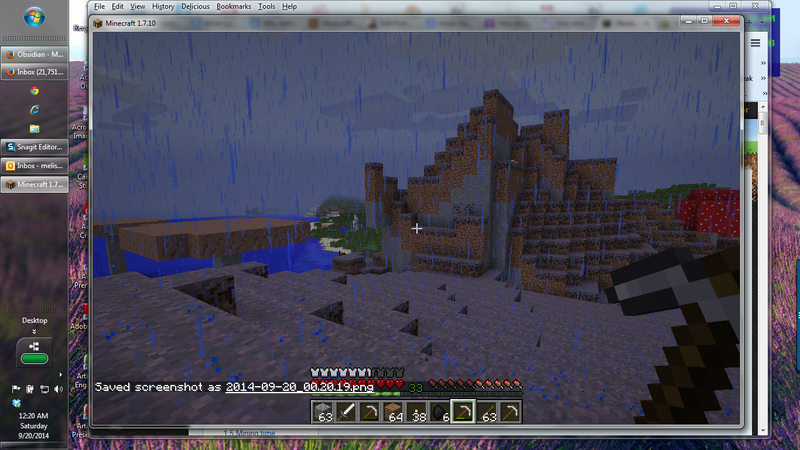 Almost literally, with a pick-axe. Even though I have not found iron yet, I think that I’ve put in enough time for this particular quest. 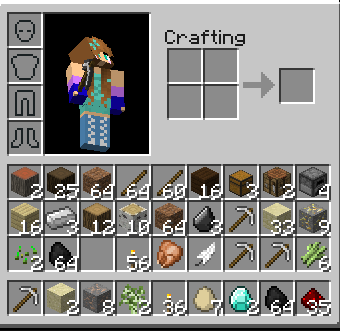 My inventory is packed and I really don’t want to start putting chests in my realm because I’ve lost track of how to find things I’ve put in various places. 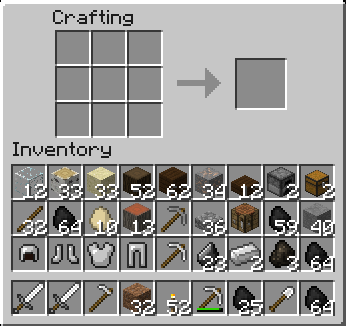 I have three crafting tables in different locations and built 3 furnaces. I put a furnace in my underground “home” but I don’t know if I’d find that dwelling again because I did a really good job of putting it in a somewhat hidden place, on accident. Colby let me know that because I chose “peaceful”, I would not have been attacked by monsters anyway. I just popped in to my realm and as usual, it is dark. Colby showed me a way to “program” the game with one line of code, but I did not catch how to pull up the box that lets me put in code. That’s OK because I’m going to “give up” for now on this realm. Two things that I may have done “wrong” are starting this in survival mode, which I truly did not intend to do; I thought I was in creative mode, and using 1.7.10. Apparently using 1.8 for this would have made more sense. In the future, I will probably use 1.8 unless the quest tells me not to. As usual, the logistics of things like the directions of the assignment are what are causing me to have trouble. It isn’t that I can’t figure out what to do, it’s that what I think I’m supposed to be doing may be way more tough than it should be because I did not understand the directions, which may have been lacking details that I needed. 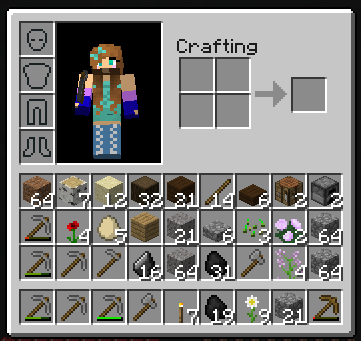 Here you can see my skin changed, flowers in my inventory, the pickaxes I created, along with crafting tables, furnaces, axes and hoes. I think I’m especially proud of the eggs I collected and the fact that I did not break too many of them, if any at all. I’m curious if after a few days in inventor if they will turn into rotten eggs and start to stink up the place. What to do? 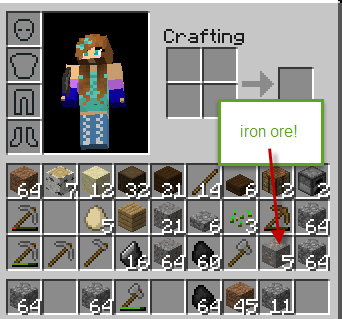 I found IRON!!!! I still am leading a very nomadic life. I’ve tossed a bunch of cobblestone in a pond to create a flat surface for me to rest upon. The sun has set so I’m going to take a break. I need to eat breakfast anyway (and take a shower). 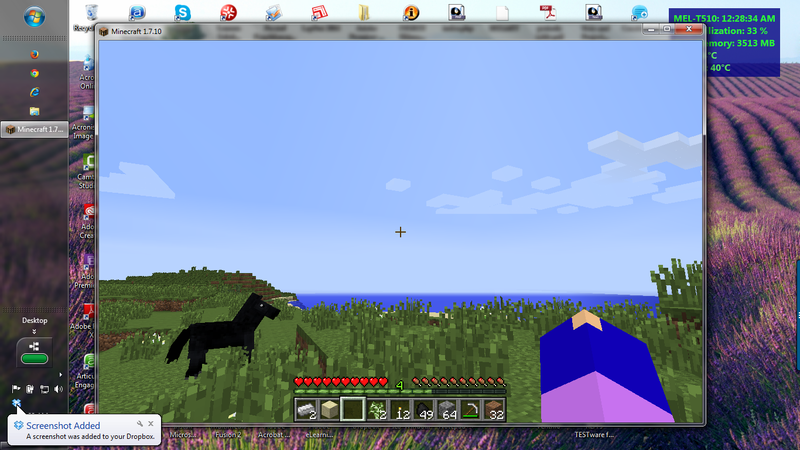 I think I’m going to put a crafting table and a forge here so I can make some really good tools. 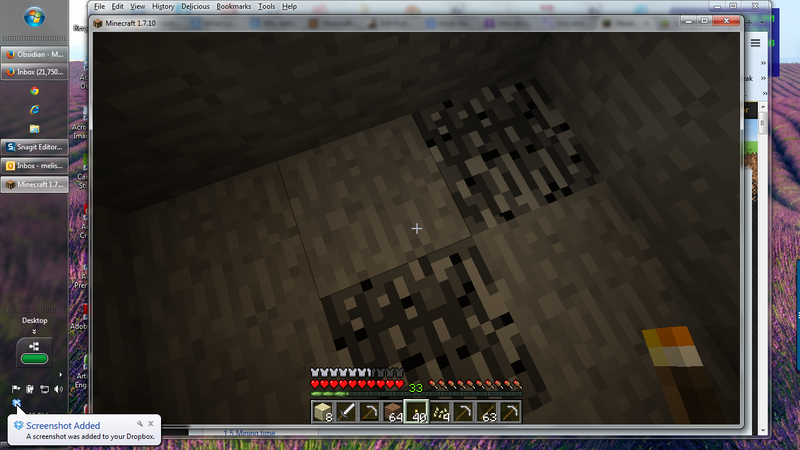 I figured out what to do with my flowers- I stuck them in the ground to mark where I had been mining. Go figure- did I just have an idea that came from ME?!? Of course I figured this out AFTER I had thrown away some of my precious flowers. I saved the seeds, though, because I have no clue what they will grow and I’m curious. 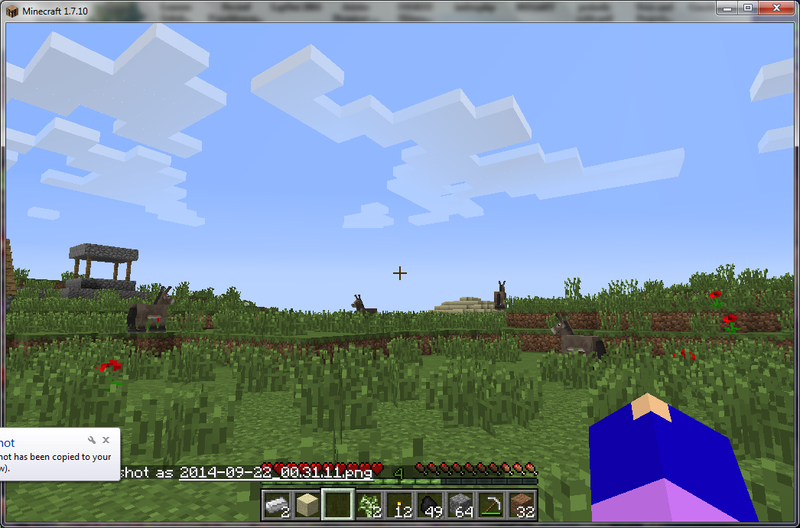 Iron Ore- 5 chunks of it! At this point I’ve already admitted defeat in the quest and turned it in, so I don’t think I’ll get any additional XP for continuing on this time consuming adventure. Does that matter? What is my motivation at this point? To find more iron! I know it is out there- but where is it hidden? Obsess, much, Melissa? So I started hanging out on my patio next to the pond and it starts to rain. Worried the pond may flood, I put up some cobblestone barriers at the edge of the pond. Now if it starts to flood, I may be creating a cesspool in my patio, preventing the water from draining into the pond. I also have some dirt adjacent to the cobblestone in my patio, so maybe the water will be able to seep into the ground. Would that mean, though, if I started digging into the dirt I’d come up with an underground water source? hmm….I have not found one yet. I guess I’ve gone in a wonderful circle. 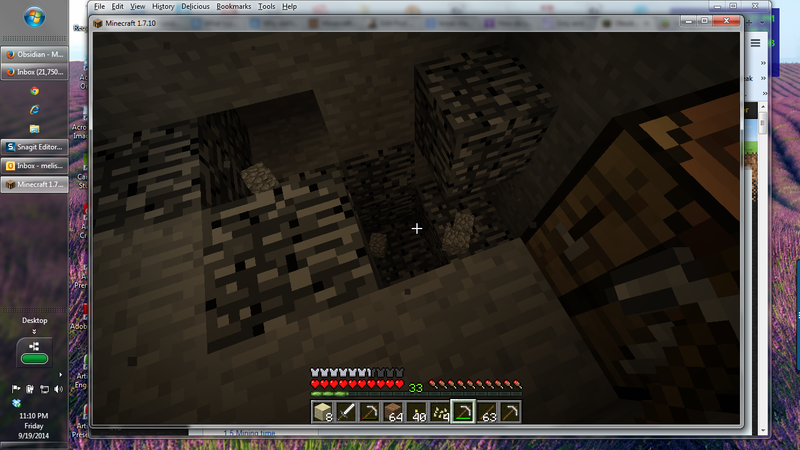 I made it back to the first hole that I dug out while looking for coal and I just went back in to look for iron. I made a short video clip so you can see how I broke through the ground. I made a patio along a body of water and set up a crafting table, a furnace, and a chest to store stuff there. Of course I forgot to photograph it— if I wander back that way, I’ll take a snapshot so you can see what the cove looks like. I’m now going to compile several of the videos and screenshots that I’ve taken over the past week. At the moment, I am stuck in an underground cave, which could be worse if there were monsters who know I’m there. At the moment, I think I am still free of monsters, but I keep hearing ominous sounds. Like with most things I don’t understand, I ignore it. I figure I’ve spent about 20 hours searching for stuff and have been rather successful. I met all the requirements for the quest so I figured I should put together all the documentation I took at various points during the game. Since I can’t effectively use SnagIt during the game, I’ve relied on the F2 button and taking short videos in Camtasia. I have no clue where the F2 snapshots are being stored so we may not actually be able to enjoy any of them. Video 1: 9 minutes of me wandering around, collecting wood, being lost in the dark, and not having much of anything other than a hole in the ground. This was pre-coal. It was also before I realized the computer’s internal sounds were not being recorded. I do not recommend you wasting your time on this silent film. It is here to give you an idea of the growth I’ve gone through in the last week. I think the last 5 minutes are a black screen b/c I was “lost” in my “home”. Video2: 4+ minutes of my first “home”, this time with sound. 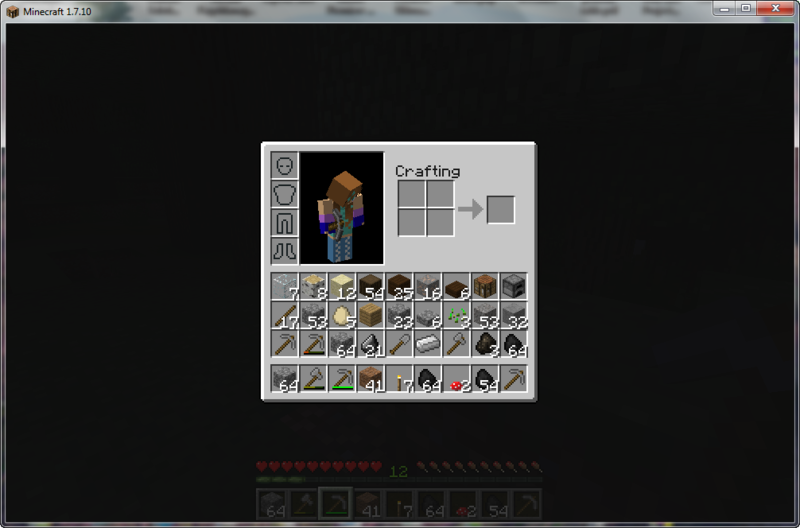 You can see I made a crafting table so that I could make some pickaxes. 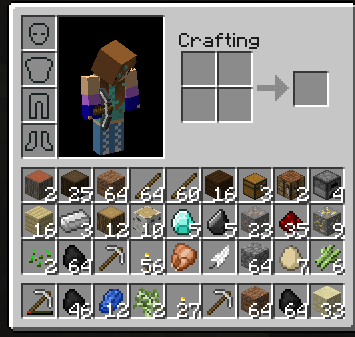 They are still wooden tools at this point because I don’t have coal or iron yet. As a FYI, after making several “homes” in various places, I tried to get back to this one so that I could use torches and go exploring again. Unfortunately I could not find my way back to this exact spot. Although shorter, this video has lots of black time because I was literally in the dark. Video3: about 30 seconds of hearing water running. It is in the dark, but I’m next to the water. I’m not sure why I videotaped this unless it was because I was happy to have found a waterfall. Video4: another 30 sec video. Obviously for this video, I had coal! There is a torch in here. I’m not sure if the sound is water rushing outside or if it is rain. 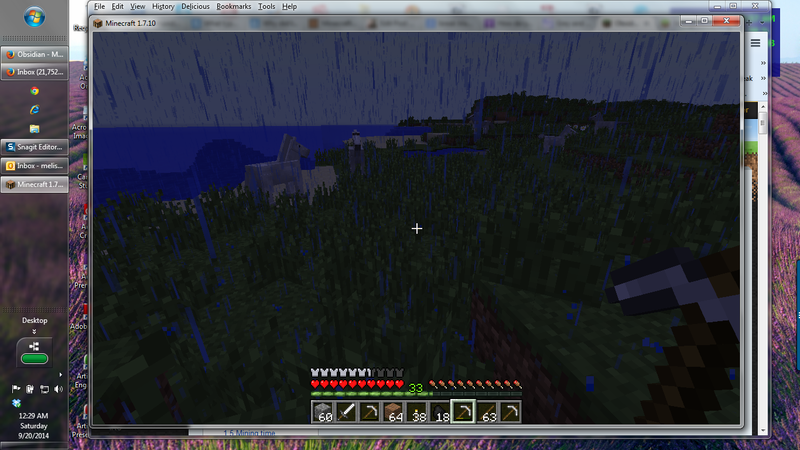 Geez, it rains all of the time in my realm. I love it, but it makes for dark skies. Video5: 45 sec video. One thing that is new in this one is the furnace. 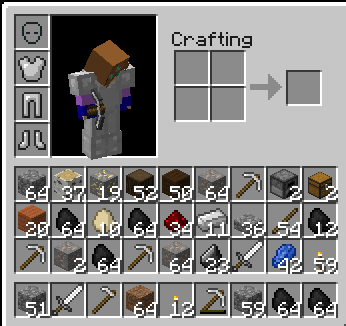 This means that I had coal and cobblestone. 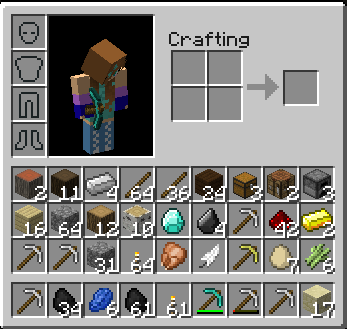 I don’t remember if I did any smelting at this point because I think I’m still without iron. Video6: about 1 minute. One thing that is very perceptible in this video are the squeaks. I just figured I’m living with mice. In another location, I learned that the squeaks are bats. Looking back at this video, it should have been obvious here that the squeaking was coming from the bat that was flying around me. I’m slow on the uptake so I really don’t think I connected squeaks to bats quite yet. Actually in later holes, I hear squeaks and still think “mice”. Very slow on the uptake. There is coal in the wall, as well as iron (Yippee!). 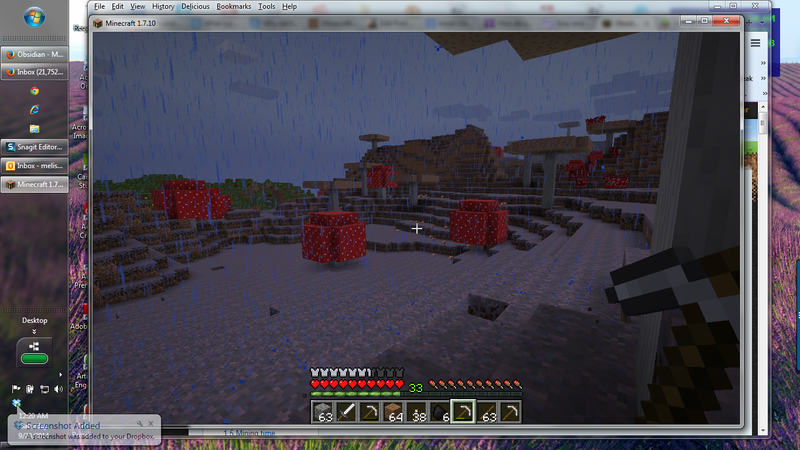 I don’t think I quite realized it until maybe even an hour later, but the red things with white dots are mushrooms. The brown flat things are not strange trees; they are a different variety of mushrooms. I encounter a grove of them in a few hours so I’ll hold off on that description until we get to that video. You’ll see 2 mushrooms in my tray, but I don’t know if I connected the red and white dot “trees” to the mushrooms in my inventory quite yet. In time I had to toss out the shrooms- they are in one of the crates I have somewhere on the land. Video7: About 6 and a half minutes complete with snorting piggies and chopping up dark wood trees. I’m using a stone pick-axe here which may actually be what I was using earlier. Unfortunately my video parameters were not set properly for this capture so it is hard to see the bottom inventory tray. You may notice that I have a crafting table and a chest in this location. 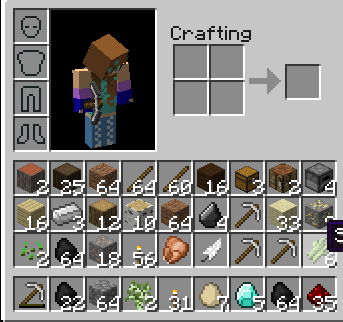 Instead of going back to previous spots that I could no longer find, I just started making new “homes” and put crafting tables, cabinets, and/or furnaces when I needed to empty the inventory or build new tools. 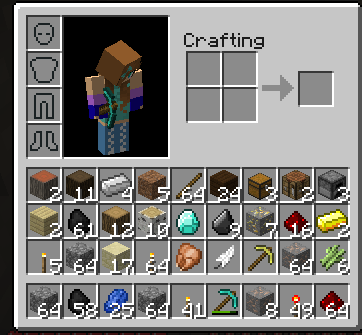 Of course I was hoping to be able to retrieve the inventory later, but I keep losing track of where I’ve been. I did not know the short brown/beige things were mushrooms yet, though. I was still thinking huge enormous tree looking like things were mushrooms. I did enjoy the variety of plant life, too. I don’t recall if there is a video of me capturing flowers, but at one point I had several of them. I chop down a birch tree in this video. Later on I started taking one cube out of a birch tree as I passed them so that I could mark that I’ve been there. I like the birch tree wood. Starting at around 5:30, I do an inventory check. I did these on video because it was the only way I could get the viewer (you) to see all of the items I’ve collected or created, along with their label. 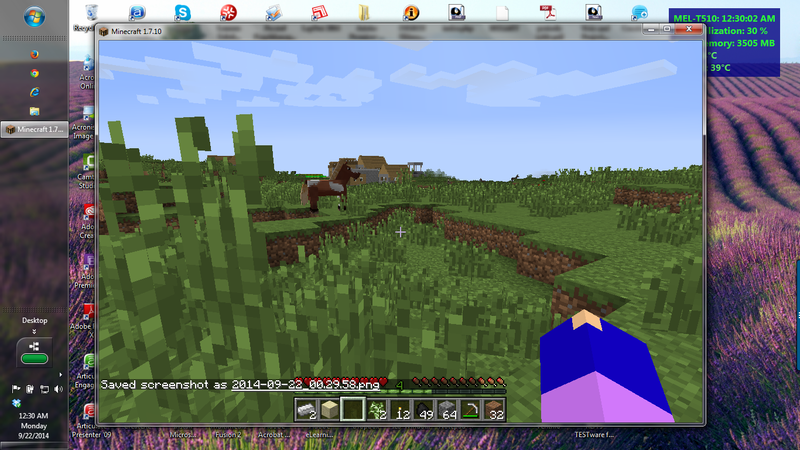 This video may be messed up a little bit b/c I downloaded MC so I could play it while the video rendered. Sorry if I trashed it by accident. I may not be able to continue to do this, though, because my machine is now running at 71 deg. video8: 3 minutes of downpour on the beach. I marvel at how clear the water is. 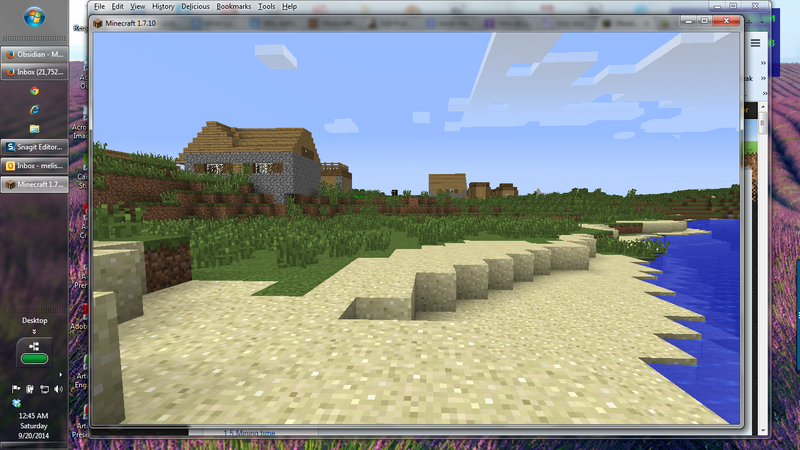 The cobblestone in my hand may be there because I plan to use it to create a bridge. I learned that I can get across water by tossing down cobblestones. 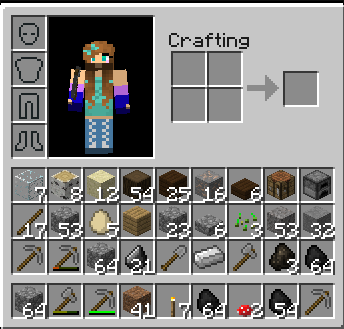 Later when I get into spots in the mines where there are really long drops, I use cobblestone to make bridges to get me to gold or other goodies safely. I also use it to block off lava and channel it. That may be in another video. This one is mostly beach scenes, rain, and inventory. video9: 2 min. 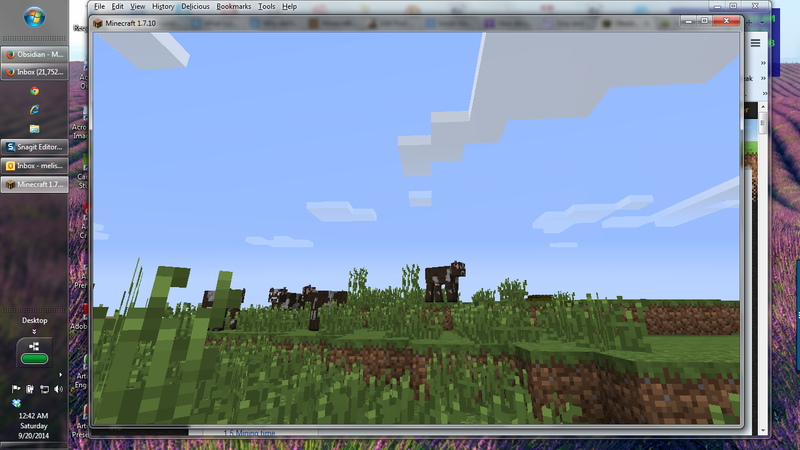 I found acacia trees. The have redish/orange insides. video10: about 4 min. I guess since I spent so much time in the dark, I figured I might as well use the time to make videos of what I’ve done and am experiencing. This is near fungus land where there is a grey covering all over everything. At first I was afraid to walk on it because there were little bubbles coming off of it. I met some sheep here. I also went down in a hole. I don’t know what I pushed, but somehow I lost all of my inventory and other clues. 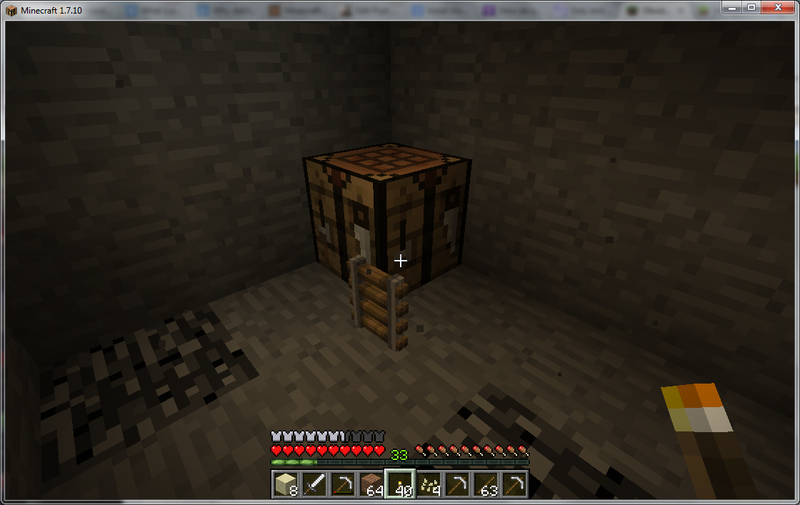 I eventually got it back, but it was odd going through the mine a bit blind. video12: about 4 and a half minutes of me trying to figure out how to make the armor. I did not edit out the trips to 3dGameLab to find the list of items I should make, feel free to fast forward. video 13: about a minute of inventory and putting things in a chest I have lost among the land. video 14: about three and a half minutes of exploring. video 15: 6 minutes of exploring in the cave near where I found lava!!! And as expected, where there is heat, we have compounds melting and cooling at different rates, therefore more metal streaks (gold! ), and some minerals (lapis). video16: 3 minutes of a thunder storm while I am trapped underground. What is up with the screeching? I’m assuming it is a monster. I get grumblings and screeches at times. I usually ignore them, but anticipate having my head ripped off at some point. video 17: 7 minutes of my inventory and wandering near a lava pit. I made this last video to document where things were when I chose to stop working on this for real. Even sitting here writing my learning log, I am having to force myself from not opening up the software just to go exploring. Can I find obsidian this time? Will I be able to mine it? Those diamonds I saw near the lava patch over there, I wonder if they are still available or if they got covered in lava when I managed to destroy a barrier. This last video is just a short trip around a lava pit. 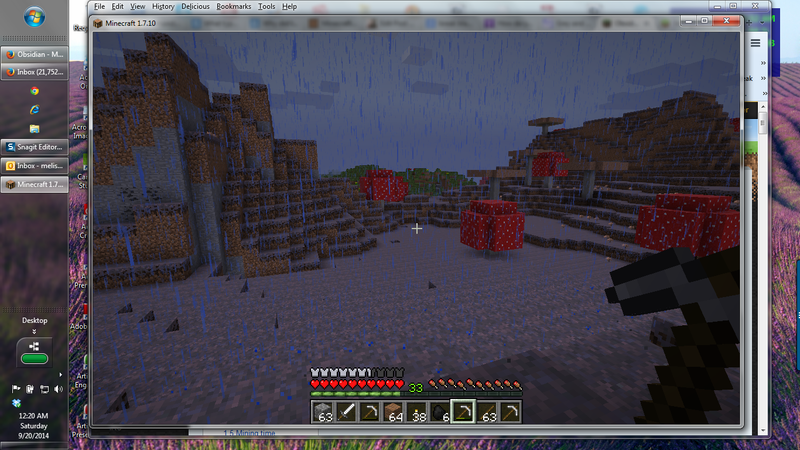 You can see the cobblestone walls I put up in case I do something stupid like cause a lava flow (again). This is from the time I drowned. 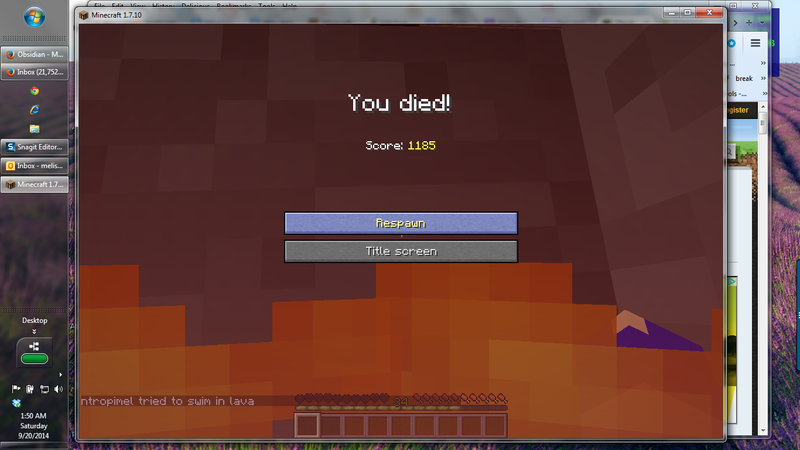 That was either the second or the third time I died. Maybe I only died twice and I’m mixing in deaths in Jamestown into my memory? Do you see the cooked chicken? I accidentally killed a chicken so I cooked it. I did not want my inventory to start to stink. Notice in spot 8 are redstone torches. I had “extra” redstone and don’t plan to make circuits quite yet. I read that I can make redstone torches (or maybe I experimented with creating them). 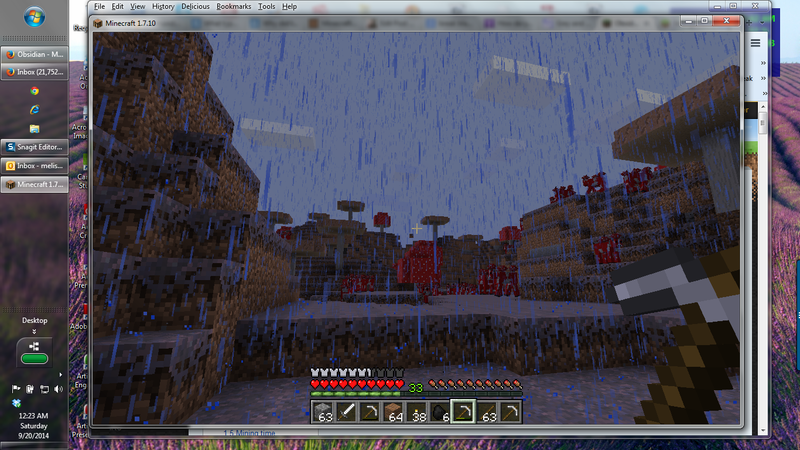 So I have redstone torches. I don’t think they are any better than the coal ones, but they’re red. BTW, lapis does not make a torch. I hit the bottom of the earth. This black and grey stuff is impenetrable. The red things with white spots are mushrooms. 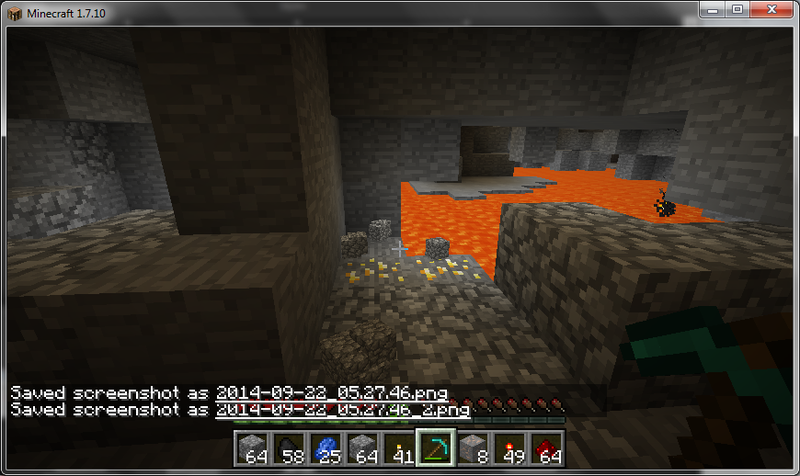 This is the time I drowned in lava. I don’t know what language they speak. One person actually spoke to me. People live in those houses in the background. 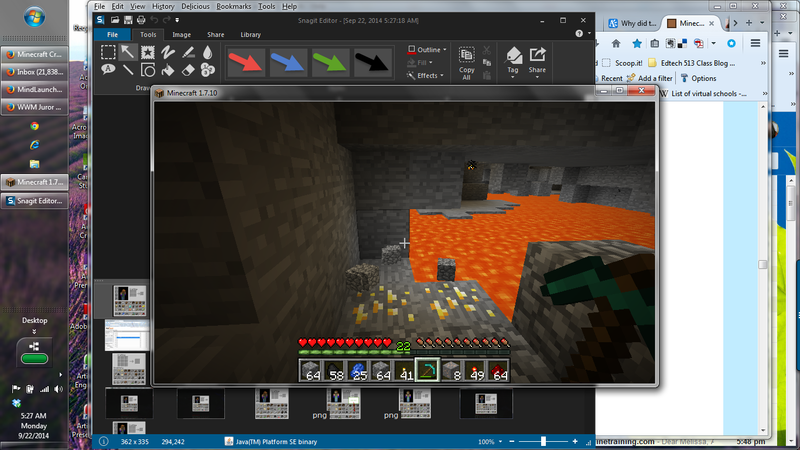 Lava and gold, I put in cobblestone reinforcements. 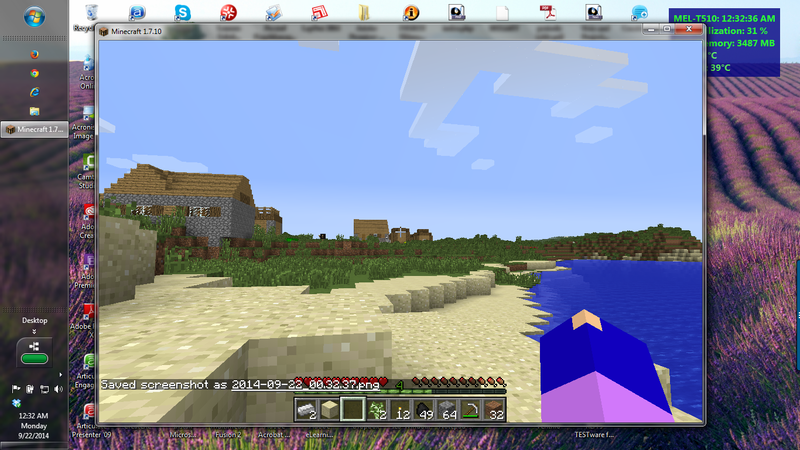 I also took screenshots that loaded into Clipmate. I then put them into a document. That document is nearly 2 Mb so it is having difficulty uploading to my website. I don’t think there is anything from the Clipmate images that is not already covered with the Dropbox images (which are here). 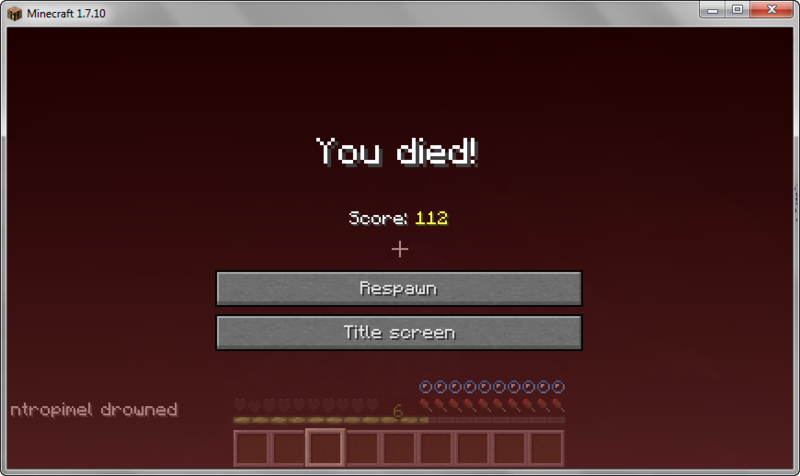 You can see both of my death screens, so I think that may be all you need to know :-). I need a break for a moment, but I do plan to put in a reflection. I have spent nearly all of my “spare” time the past week creating this realm and playing in it. I think I died 3 times- not sure why I only have 2 death screens, though. I have had lots of reflections going through my mind this past week. After I get caught up on my sleep, I intend to come back to add them here. Looking back at the time stamp on the first snapshots, I can’t believe I’ve only been doing this for a week. 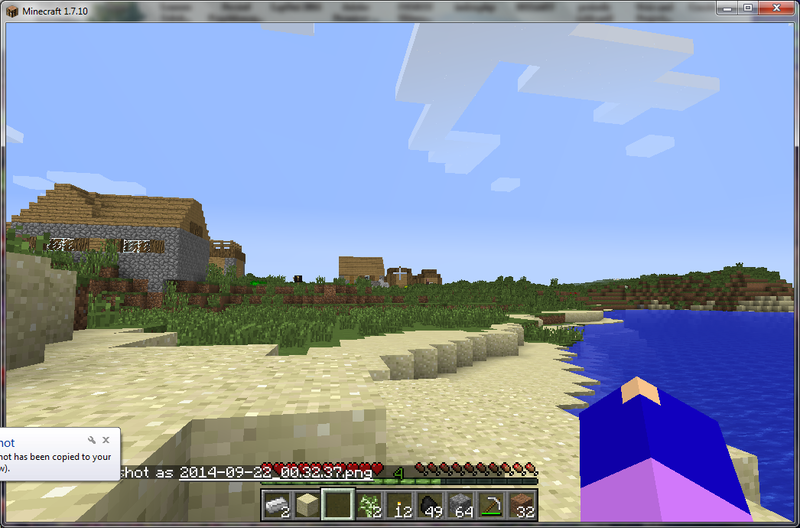 I am fully addicted to playing Minecraft in my realm. I am not addicted yet to playing it with others or playing it in a way that there is a real purpose like the Acropolis that I still have to build. When I reread my first impressions I am almost embarrassed because I was such a doggone wimp! I need to keep it there as a reminder of reality and what some of my students may go through. I was a bit frustrated at the lack of structure in the course, but I’m getting used to it isn’t bugging me as much as it was (I hope). This place, however, is not where I need to go into that topic. Here I get to talk about all of the really cool things I went through in this experience. In fact, if I do this with my students at all, it will probably be as a lesson on perseverance. Short story made long: Last summer I took a class on South Dakota Indians to meet that requirement for their teaching credential. Our final project was to take Joseph M Marshall III’s book, The Lakota Way, and make a lesson out of each chapter. I spent much of the summer enjoying learning about South Dakota history and especially enjoy anything Mr. Marshall writes. Perseverance is one of his chapters. 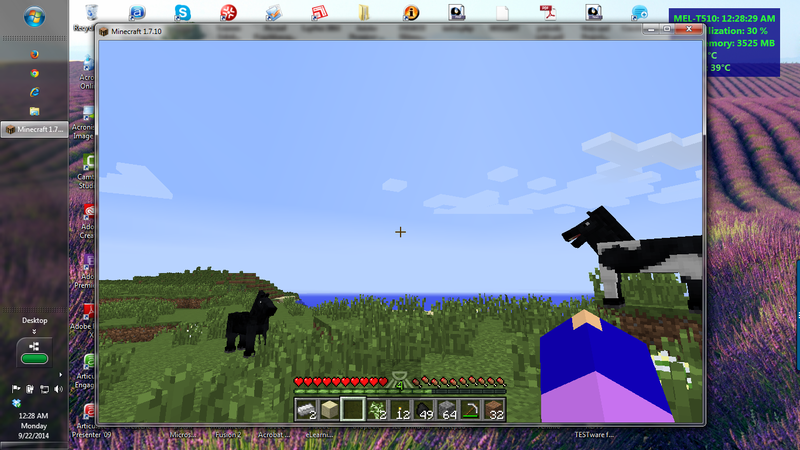 While doing the Minecraft adventure, I realized what I needed was more perseverance in the beginning. Learning how to persevere is an important personality development because it lets you have strength. Doing science does not always make sense. As much as many teachers try to break things down into tiny pieces so students can be successful in increments and therefore not become overwhelmed, doing real science requires respawing after going for a swim in the lava. Too many students give up too soon. Hey look at me!!! That is what I did! I admitted defeat after only a few hours of playing. Even though I had done the requisite quests and even had my own note taking system going for me, I was still too unaware of what the bleep I was supposed to be doing. I could possibly bring in a chemistry connection, but I can’t tell if chemistry rules are being followed in the game. 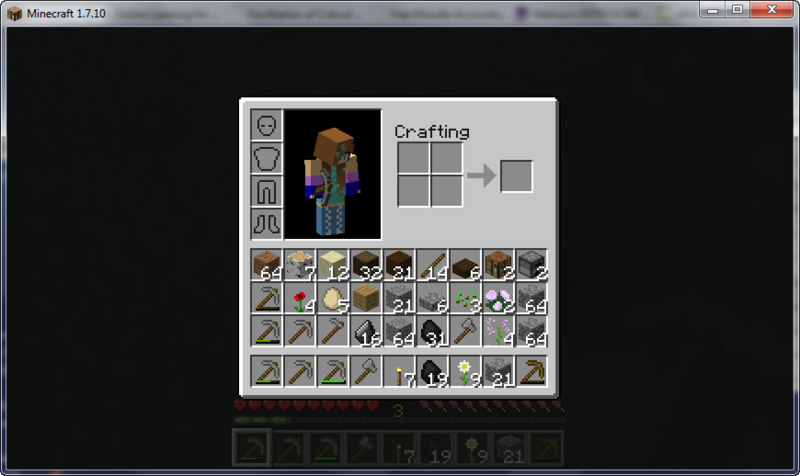 I was glad to see that my gold pickaxe was wimpy, even though I’m not thrilled I wasted 3 gold ingots on it. I don’t know why they bother having us make a gold pickaxe in the first place. Gold should be wimpy, it is actually a very soft metal. I was glad to see that was being observed. Having partial physics in the game allows for the element of surprise, like when you knock out the block that turns into gravel and the next one just slides on down. I’m really glad I was not knocking out one of those blocks directly over my head. Why are the mushrooms so freaking large? Do these programmers have an obsession with shrooming? Why the fungus hills give off bubbles. Why the groundrock- or whatever that black and grey rock is called- gives off bubbles. Are those bubbles toxic? Should I be trying to capture them somehow? How many times can I regenerate? How many ways can I die? Am I actually supposed to eat? If so, how do I do that? Is there an advantage to using one type of wood over another? Will I be able to control my urges to play the game? 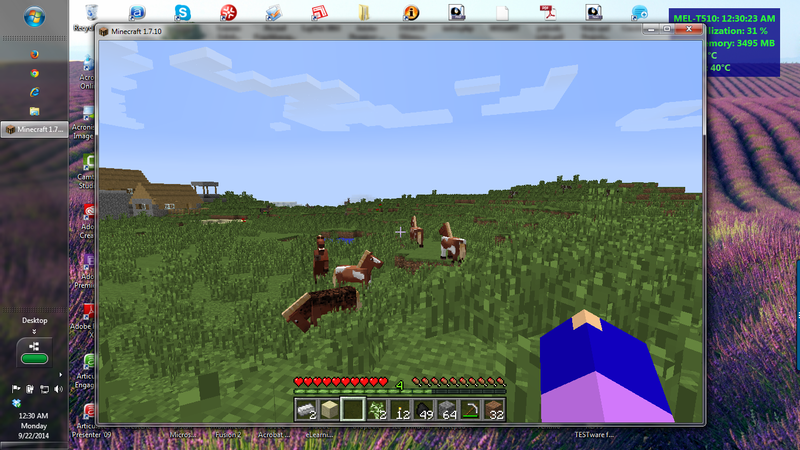 What are those cows that look like they have mushrooms on their heads? I could not fly in my game, nor did I want to. 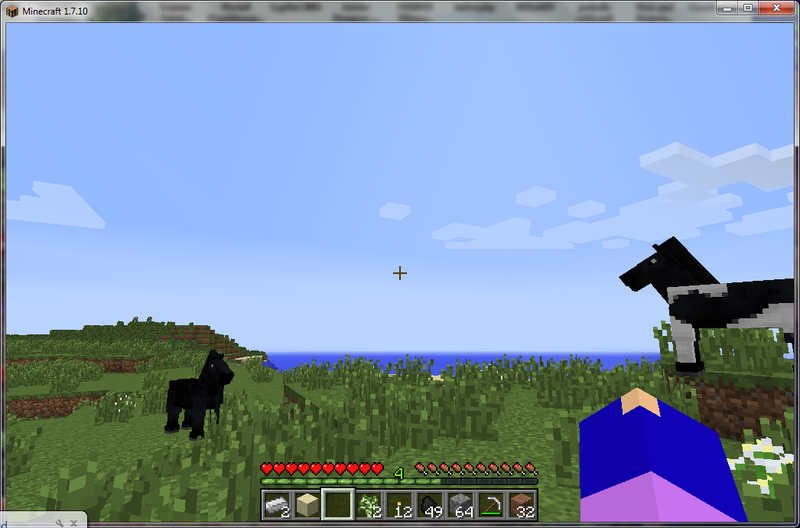 I completely forgot that I can fly in some worlds. If you have not played the game in this way yet, don’t read my observations. If what you saw in my snapshots and videos does not already spoil things for you, my following comments may. You won’t see an item until you have accomplished what comes before it. I did not see iron before I saw coal. Even when respawning, I had to go through the phases. Chop up a tree with my hands, get a chunk of wood, make planks, make sticks. Use a stick to chop up wood to get more wood to make a wooden axe. Once I had a wooden axe, if I went looking in the right places, I could find some coal. 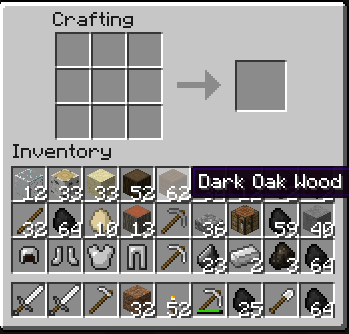 I don’t know how much wood I had to chop before I could see coal. 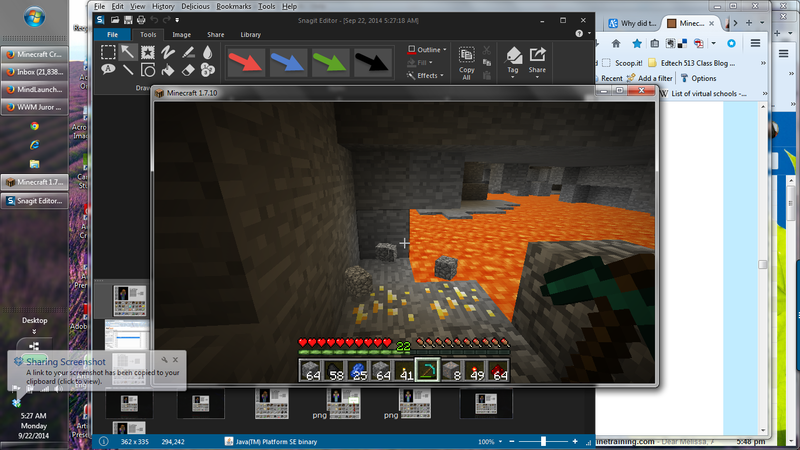 Once with coal, make torches so you can go exploring in dark caves. You need to go in the cave to find the iron. Once you have iron blocks, use your furnace, which was easy to make because you’ve chopped through so much cobblestone that you could open up a cobblestone factory. 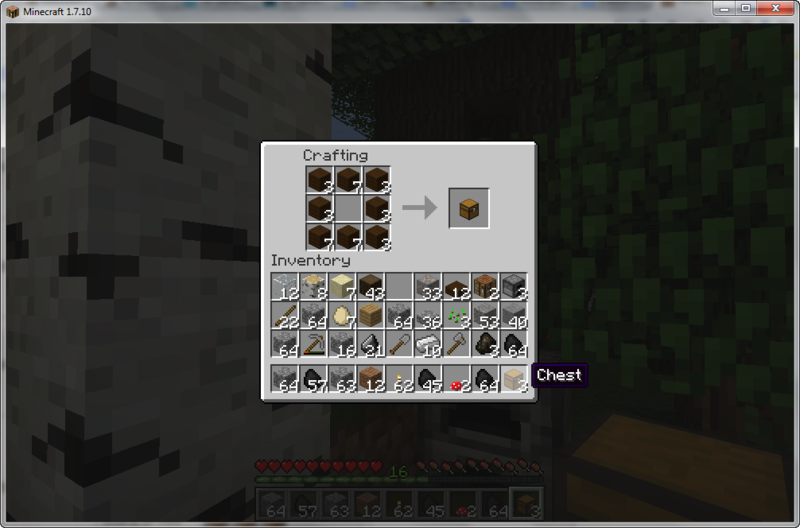 Smelt the ore to make ingots. 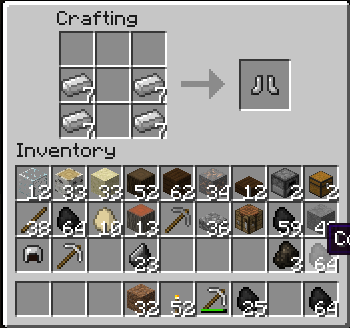 While I used to keep some unplanked wood around just in case it seemed like I’d need it, I have found zero need for iron ore. Go ahead and put all of it into ingot form. Don’t worry about using the coal because it will become easier and easier to find. Then go exploring. Chop up this, dig through that. I got caught in dark holes without access to torches so I know there is a way to get out of what seems like total emptiness. Let your eyes adjust and try jumping to see where “up” is located. Once you know which way is up, keep chopping until you get to the top. You may have to make steps to get out of a hole if you fell really deep. That happened a few times. I’d be chopping and accidentally chopped the block I was standing on. Woof, I’d fall with a thump in a totally dark pit with only the one square’s worth of light getting through. That happened after one of my regenerations- I was trying to be so cautious and make sure I could find my crafting table and furnace if I died and regenerated back to this spot again. I picked flowers and made a line around my objects. There was an obvious pit, though, and while trying to scope it out so I could barricade with with cobblestone, I chopped up the wrong block of dirt. 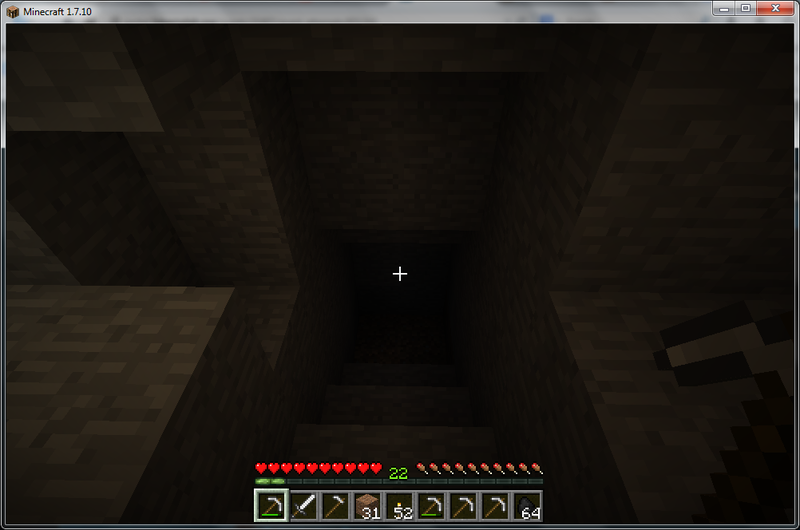 I did not have coal yet so I had no torches and was who knows how far down a hole. That took a few hours to get out of. If you see lapis or redstone, you are getting near lava. You have to be near lava to get the “good” gems. That makes sense because that is how the real earth works. Compounds cool at various temperatures so things will crystalize at various distances from lava. Lava has no mercy. You don’t want to jump in it unless you’ve figured out how to swim. You cannot walk on water. You can try to toss down cobblestones to make a path, but you are not always allowed to toss down a block. You may have to live with the fact that you won’t get to go exploring on that tiny island that is so close you can almost smell it. 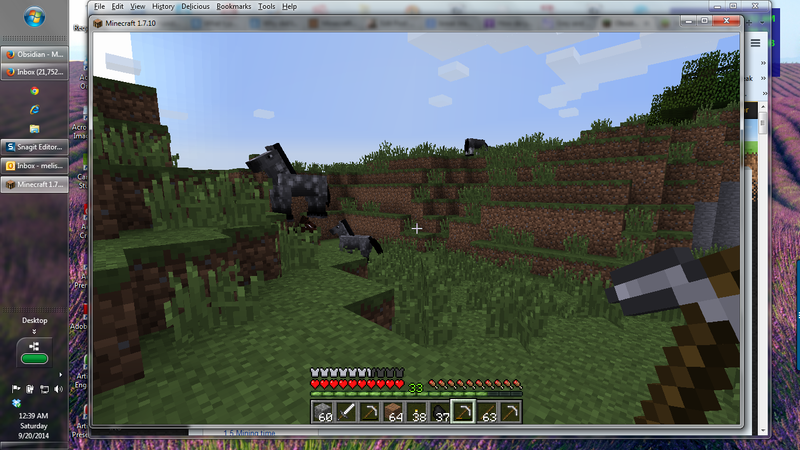 I only saw obsidian once, and it was right before I went swimming in lava. Unfortunately I could not remember how to get back to that exact location so I have not found it again. I have also not found it since that time. Make multiple furnaces, crafting tables, and chests. You never know when you’ll just want to whip one out so you can refresh your pickaxe or torch supply. It is just easier to make them when you have the supplies and they only take 3 inventory spaces. It took me a while to see the value in chests. I learned about them when I came across them in an old mine. I found things in chests “others” had left behind. I could do that throughout the realm to be nice to others (if there were any) or to help me after a respawn. When you die, you lose everything. It is very true, “You can’t take it with you.” So if wandering around I come across a chest with “leftover” wooden pickaxes, it may not be a bad thing. After some time, I started to use chests to store extra eggs, flowers, or other items I don’t know how to use yet. Don’t worry about cleaning up after yourself. (Yes this is a game made for me!) Leave out the crafting table, furnace, and the chest if you used one. You’ll be glad they are there if you run into them at a later time. You are not limited to making only one of those items. I was cleaning up my torches for a while so I could reuse them. Then I realized that by leaving the torches, it was a way of letting me know I’ve already been here. Plus it was a torch I did not need to make for that future time (where I was now using them). Keep digging for coal even if you have enough because some life force thing flies out of them. I was under the impression the green lights were good. I will add more as I think of it- I keep writing these memos in my head hoping I’ll remember to put them down in electrons. 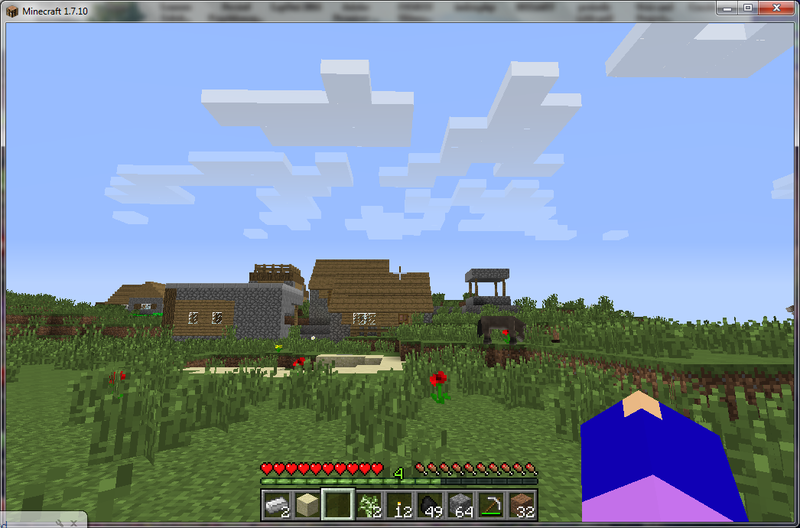 Posted on September 13, 2014, in EDTECH 531 and tagged EDTECH531, Minecraft, video. Bookmark the permalink. Leave a comment.